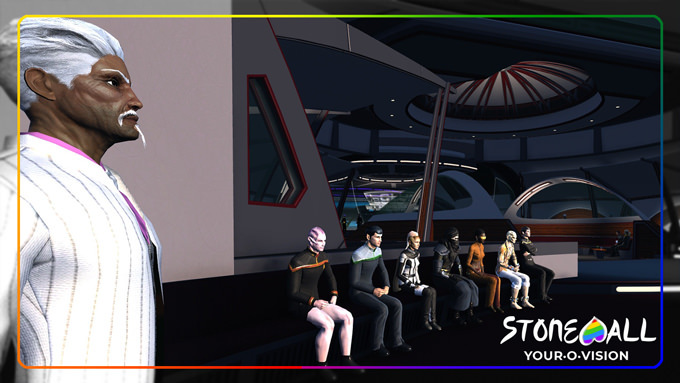 You can use every option that the STO tailor offers which you can wear at the chosen location. Also, feel free to enhance your performance with emotes or special effects. As in the real Eurovision show, there are no pets allowed. For detailed informations about the categories please look below. Please note that in this fashion contest there will be a new procedure to determine the winners. It will not be the same procedure as every year, no, for the Yourovision Event we made up a voting system in tribute to the original EBU voting system! If you participate in a category of the contest you will also be a member of the jury for this category. You have 8, 10 and 12 points to distribute for your 3rd, 2nd and 1st place. You are not allowed to vote for yourself. The voting points will be collected by a neutral observer of the contest and then summarized together. The results will be posted here later. 2 Stonewall Credits, 1 lockbox key, and a costume item! 1 Stonewall Credit, 1 lockbox key. "You can break the rules of fashion and your chance to win shall grow..."
The totally trashy trends of the ESC are famous all over the world. When trying to gain attention and make the performers look memorable, fashion designers have gone to unexpected distances and produced many fascinating blossoms of tastelessness. 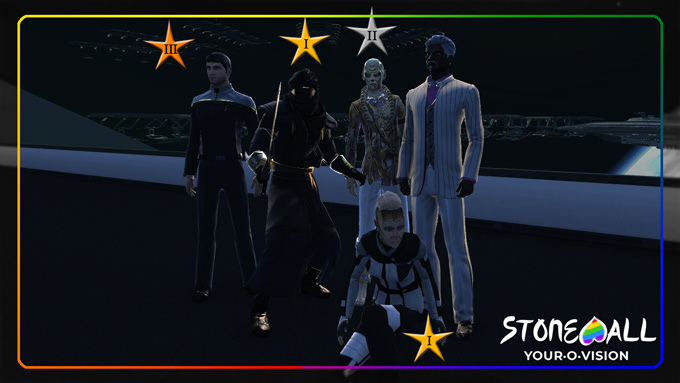 Show us either a look-alike of a really trashy costume or your very own vision of what a trashy ESC costume could look like on your STO toon! This contest takes place in the bar of Nimbus III so you will be able to wear off-duty, formal and uniform costumes. "And we're all gonna shine a light together..."
Many contestants do not enter the stage alone – a lot of entries feature a group of artists. And those usually wear matching outfits. We want to honor this eurovision tradition of group costumes. Therefore, this category requires you to design a complete eurovision group by using not only your captains toon but also the members of the away team! Can you make your captain and away team members look like a real group from the Eurovision history? Please be ready to name the artists name, their song, the year and the country they represented. You don't have to use all four members but at least one designed Boff is required. Or, would you rather show us your personal vision of an ESC group costume design? That's okay too. We are curious to see your designed teams in the Nimbus III desert. "I will be popular, I will be popular, I'm gonna be so popular..."
When a country sends one person alone to the big eurovision stage, you can be sure a lot of people put a lot of thought into what this one person is supposed to look like on stage. In this category you are asked to make your toon look just like a real ESC contestant that represented a participating country in at least one year. Only versions of people who made it to a semifinal will be accepted, but you cannot take part with a look-alike of somebody who only took part in a national final. As this still leaves us with hundreds of possibilities, please be prepared to name the artists name, the song, the year and the country they represented. 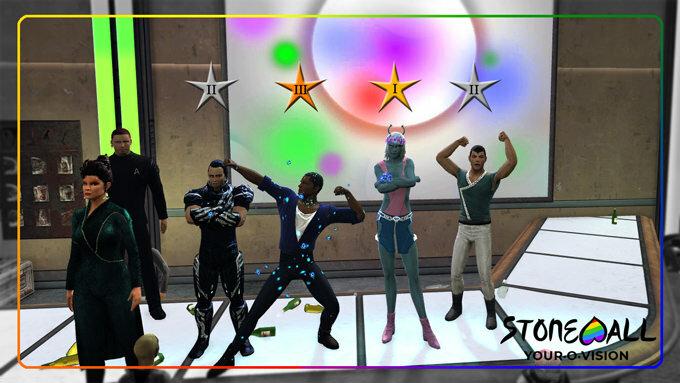 This contest will take place in Club 47 on ESD, so you can wear off-duty, uniform, formal and club outfits. "Beauty never lies, never hides, never gives a damn!" Every costume in the ESC is unique and, most of the times, a piece of art in itself. So now is your chance to channel your inner diva and show off to your fleethearts the most glamorous look you can create with your STO toon! You are not required to copy an existing costume. Feel free to let your fantasy make some wild dances and show us a miracle of fashion and what you can do with the tailor! We wanna see grandiose gowns and amazing outfits! Give us glitter and glam and leeeeet's do this! 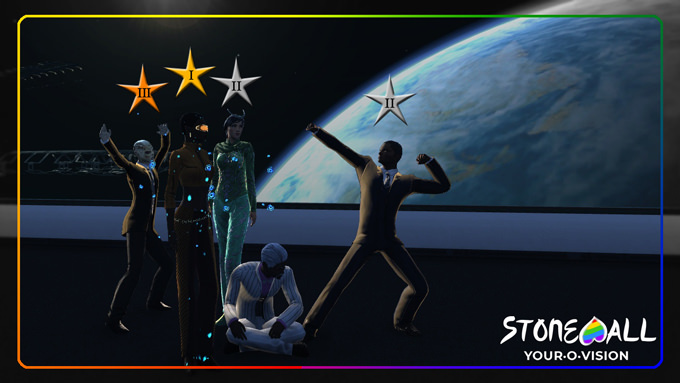 This part of the contest will also take place in Club 47 on ESD, so you can use all tailor options from off-duty, uniform, formal and clubwear. Have fun designing your costumes and enjoy the Eurovision Song Contest while you wait for (y)our #yourovision. Finally! The costume contest is over, as well as the Eurovision Song Contest, and, as predicted, it was a show of glamourous glitter and timeless trash. No winners in this category, as there was only one participant. Nevertheless, here's the honorable mention: TedHembach as Lordi, the finnish winner from 2006. 1. Place ~ Sirannataan, with the stunning maximum of 36 points! 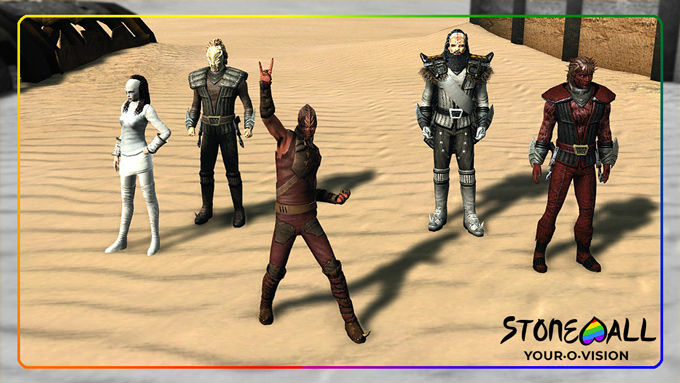 Each first place will get 2 Stonewall Credits, 1 lockbox key and a lobi fashion item. Each second place will get 1 Stonewall Credit,1 lockbox key and a fashion item from the winter store. Each third place will get 1 Stonewall Credits and a fashion item from the summer store. Please note, as the Teds planned and managed the event, they refrained from getting any prizes from this contest. Thanks to all participants for showing off their ideas and styles!